One of a kind luxurious california contemporary smart home under construction by legendary hollub homes with 65 years of timeless construction expertise. A perfect family retreat with an exceptional floor plan that merges the indoor and outdoor spaces. Thoughtful design excides modern luxury. The home and attached guest house are beyond compare, nestled on 52,707 ft. Of breathtaking grounds in north pinecrest, featuring 6 bd, 7. 5 baths and 3 car garage. The spacious guesthouse offers maximum flexibility with 1 bedroom, 1 bathroom, a kitchenette and a living room or large yoga/meditation room. The guesthouse is prepped to be a 2bd/2bath. Main house includes club room, wine room, media room, playroom, dream gourmet kitchen and resort style pool. Sales associate is an affiliate of seller. Modern manse in ponce-davis! Live the life you love in this magnificent, ideally situated, brand new home in your favorite neighborhood! Features of the 8,788sf home include 7bd8. 5ba and a magnificent guest house. The vast master suite includes a sitting area, private terrace, his & hers closets & a gorgeous garden/pool view. Want some private entertaining? Look no further than your very own 1,375sf rooftop terrace! The homes finishes include impact windows & doors, italian chef's kitchen, 5 a/c systems, elevator, glass railings, 8ft interior doors, camera-ready exteriors, marble/wood floors & a private gated entry. The centerpiece of the breezy, shady, gorgeous back yard is the l-shaped pool adjacent to covered terrace and summer kitchen. Welcome home! 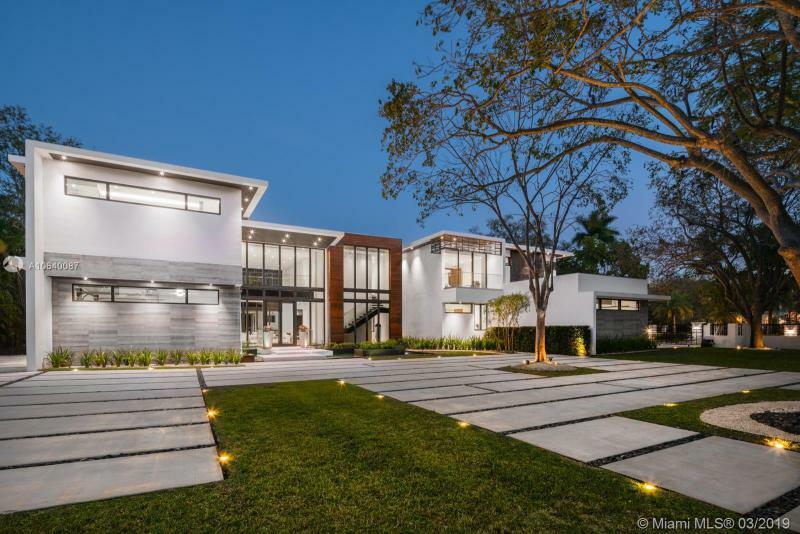 Located in the prestigious ponce-davis neighborhood in miami, this contemporary new construction home is ideally situated on a half-acre corner lot boasting mature trees. The 8,326sf floorplan is comprised of 4bd & 4ba upstairs & 2bd 2. 5ba downstairs with 1bd & 2ba in the guest house. The spacious master suite includes a sitting area plus a private covered terrace. Boasting impact glass & doors, 5 a/c systems, elevator, glass railings, marble & white oak floors & a beautiful gated motor court, this estate is ready for its fortunate owner! Enjoy the beach-entry pool w/ adjoining covered trellis & summer kitchen. Other features include: italian kitchen w/ sub-zero & miele appliances, 8ft interior doors, camera-ready exteriors, digital sprinklers & 2-car garage. New and improved! Ready to sell! 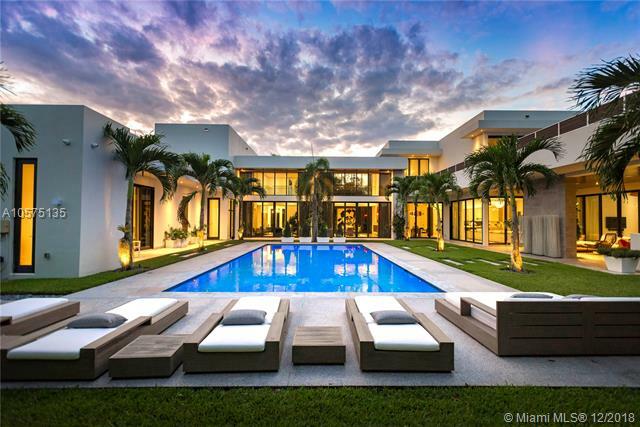 Elegant tropical florida estate in the heart of north pinecrest's most desirable district seamlessly melding interior and exterior spaces with an exceptional open and spacious floorplan. Features include gated entrance, living room with 30ceiling and double sided fireplace, huge open chef's kitchen with soap stone/ marble counters, top of the line appliances, butler's pantry, large family room with auto telescoping doors, billiard rm, wine cellar, library, home theater , 52' saline pool, summer kitchen plus guest house on beautiful grounds! Dramatic staircase leads to the bedroom quarters. Romantic master suite with fireplace, balcony mother of pearl inlay & ceiling fill. All rooms with en-suite bath. Two attached 2 car garages. Truly discerning details.